Big news for Cooliris this morning as Google unveiled its Nexus One “Superphone.” You can read our review of the phone here. The search and technology giant has tapped the startup to enable media browsing on its shiny new phone. The startup has been pushing the limits of interactive photo and video browsing with its 3D Wall, a browser plug-in for Internet Explorer, Safari and Firefox that enables users to enjoy viewing their photos on Flickr or Facebook and their YouTube videos in a rich setting. 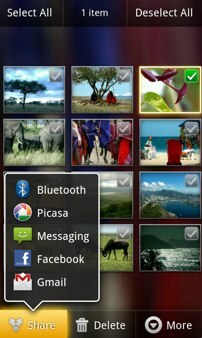 The new Gallery application, powered by Cooliris, for the Nexus One is a native app to enable browsing, organizing, sharing and editing media within one application. The Gallery is designed to scan quickly through thumbnails of media and loads the high-resolution versions on selection, making it easy for users to quickly browse their photos and videos. Using geolocation and tagging, users can sort their media into digital stacks by date, time and location, making it easier to find and organize photos and videos. Users can also pull existing albums from their desktops or access Picasa web albums. One interesting feature of Gallery is the two-way sync with Picasa albums, allowing users to update and access their Picasa media on-the-go. Users can also easily share their videos and images from within the app through email, MMS messaging, Picasa, or a Bluetooth connection. Publishers a have been flocking to enable Cooliris’ nifty browser add-on. Most recently, CBS Interactive’s TV.com, one of the premier websites bringing episode guides, news, reviews, interviews, TV listings, and more to a primarily U.S. audience, started using Cooliris technology to enhance its ‘Shows’ section. Backed with about $18.5 million in VC funding, Palo Alto, CA-based Cooliris has also debuted an compelling way to generate advertising revenue with its service. The partnership is a big coup for Cooliris. Though there are no signs of an acquisition yet, but it wouldn’t be surprising considering Google’s phone’s deep integration with the startup’s technology.